PHOENIX – Local organizations, community leaders and immigration attorneys are teaming up to give donations, organize fundraising events and offer free legal services for the DACA recipients who have less than a month to apply for renewals. President Donald Trump’s decision to phase-out the Obama-era program in the next six months allowed renewals only for DACA recipients whose permit expires between Sept. 5, 2017 and March 5, 2018. The wind-down procedures also established Oct. 5 as the deadline to accept renewal applications, leaving eligible DACA holders with less than 30 days to apply. Local advocacy organizations are concerned eligible DACA recipients will have a hard time coming up with the nearly $500 it costs to renew the program, in addition to attorney fees, in such a short time. They say many of them may not be able to apply because of lack of resources. “When I learned about the actions taken by the president affecting the lives of the soñadores, I was shocked,” said Roberto Reveles, founder of the Somos America Coalition. “But we need to get over the shock. We need to recognize that there are a number of Arizonan DACA recipients who are eligible for renewal,” he said during a news conference where he and another community leader spoke about their motivations for donating money to fund renewals. “Our community needs to step up in this moment,” said Tommy Espinoza, president of La Raza Development Fund, who also talked about his donation. Reveles and Espinoza donated $5,000 each to immigrant rights organization, Promise Arizona, which is helping DACA recipients with their renewals. Espinoza also wanted to send a message. “I challenge the Latino business community to step up,” he said. Community leaders said around $3 million is needed to pay for the application fees of the estimated 6,000 eligible DACA recipients in Arizona. For Noemi Arroyo, any economic help would make a difference. 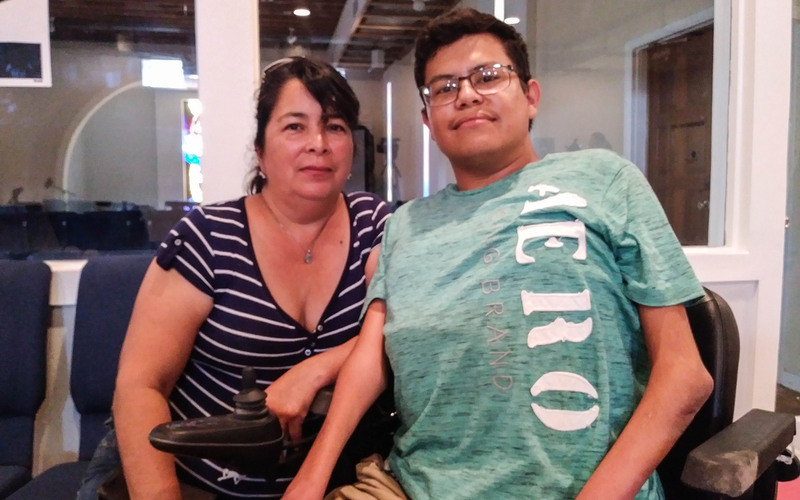 Arroyo is the mother of two DACA recipients, one of whom depends financially on her husband because he was diagnosed with Charcot-Marie-Tooth disease, a condition that damages nerves and muscles and limits mobility. Diego Sanchez, Arroyo’s son, renewed his permit in July, before DACA was repealed. She said they were lucky because it usually takes them around three months to save for the renewal fee. Arroyo sells used furniture at a swap market and her husband is a maintenance worker at an apartment complex. A one-month deadline would have put them in a difficult position. “It all costs money. Somebody (has) to prepare their documentation, and each attorney charges their own fee,” said Yolanda Medina, a member of the Council on American-Islamic Relations (CAIR) in Arizona. Recently, CAIR Arizona and other organizations started an online campaign called “Help AZ Dreamers pay for DACA”. By Monday afternoon, the website had collected $14,240 from 159 donors. Medina said the network is also hosting different “DACA Drives” in Mesa and Phoenix to fill out the renewal applications. The First Congregational United Church of Christ, which also offers sanctuary for undocumented immigrants who are facing deportation procedures, hosted a similar event on Sept. 16. Attorneys with the Law Offices of Daniel A. Rodriguez are offering free services to fill out applications at the church, which is also receiving donations to fund DACA renewals. “We should try to raise $3 million. That is doable in this great state of Arizona if we decide that this issue strikes at the heart of families,” said Espinoza.